Does making the next great technology product excite you? Imagine what you could do here. At Apple, our new ideas have a way of becoming great products, services, and customer experiences very quickly. We bring passion and dedication to our job and when you are a part of that team there's no telling what you could accomplish. 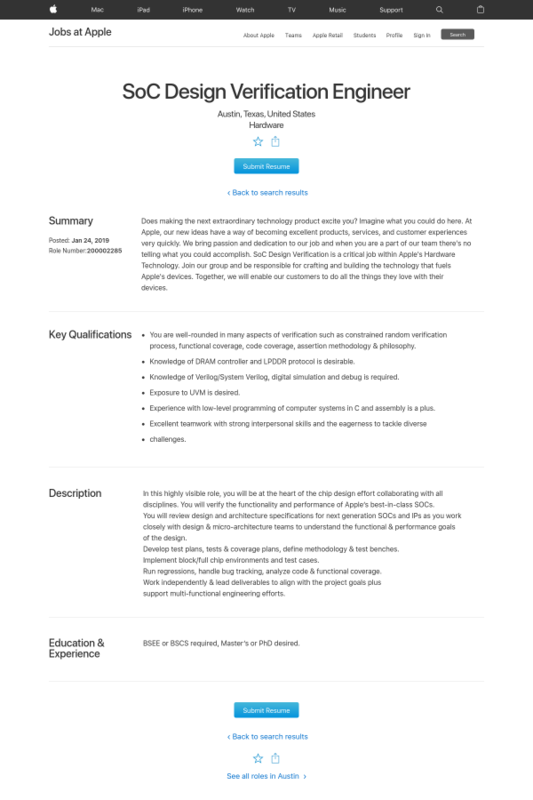 SoC Design Verification is a critical job within Apple's Hardware Technology. Joining this group means you will be responsible for crafting and building the technology that fuels Apple's devices. Together, you and your team will enable our customers to do all the things they love with their devices. You are well-rounded in many aspects of verification such as constrained random verification process, functional coverage, code coverage, assertion methodology & philosophy. In this highly visible role, you will be at the heart of the chip design effort collaborating with all disciplines. You will verify the functionality and performance of Apple’s premier SOCs. You will review design and architecture specifications for next generation SOCs and IPs as you work closely with design & micro-architecture teams to understand the functional & performance goals of the design. Develop test plans, tests & coverage plans, define methodology & test benches. Implement block/full chip environments and test cases. Run regressions, handle bug tracking, analyze code & functional coverage. Work independently & lead deliverables to align with the project goals plus support multi-functional engineering efforts. Are you ready to join the team and immerse yourself in technology of the future?